Jazeman Jaafar led the way in the opening day of the first 2012 official test session for the British F3 International Series yesterday, but the weather turned for today’s running and Jaafar opted to sit out much of the session, completing just five laps of the Snetterton circuit late in the day as the track began to dry. Atrocious weather kept Jaafar and his new Carlin Dallara F312 British F3 car in the garage for the majority of the day, along with the majority of the drivers at the test. Rain poured for much of the day, only letting up towards the end of the day, when Jaafar took to the track. With conditions remaining unsettled the young Malaysian driver opted to complete a handful of laps, preferring to save his running for the next test session. Jaafar explains, “The rain was really bad this morning, making visibility really poor and drenching the track, so it would have been foolish to be out there in a race car. It wasn’t far off being a Malaysian monsoon, just not quite as warm! “I did venture out on to the track late in the afternoon, but I didn’t feel that we would be able to achieve much and there was little time left of the session to make set up changes and develop a damp set up for the car, so my engineer and I decided not to push for a time and cut short our running. 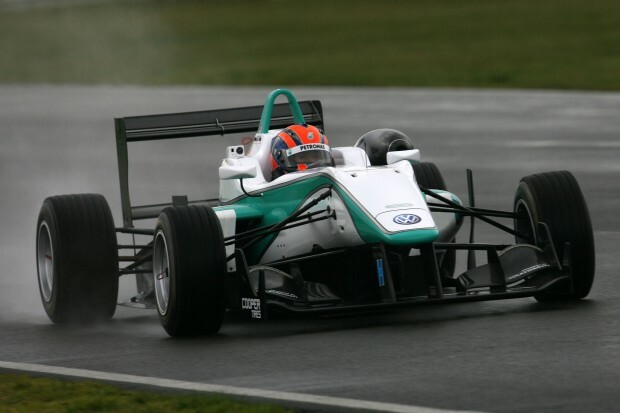 Pre-season testing for the 2012 British F3 International Series continues next week, with Rockingham Speedway hosting two days of running for Jaafar and his rivals.